When a crystal explosion wreaks havoc across the world, a goddess creates a hero to combat the ominous threat left in its wake and to restore peace and balance to the land. You are that hero, Ginger, and if you think the world is going to save itself then you'd better find an online course titled 'Video Games 101', because you've got a serious task on your hands! 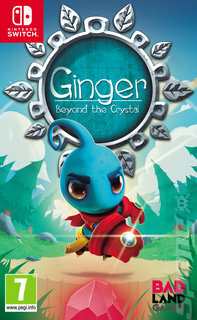 Ginger: Beyond the Crystal has a lot in common with the classic 3D platformers of yesteryear like Mario 64 and Banjo Kazooie. Its world is bright, vibrant and has a lot to explore. The core action of the game involves travelling different aspects of the world (including ghostly craters, coral planets, crypts filled with infinite staircases and sleeping caves - developer Drakhar Studio gets points for some out of the box thinking!) and engaging in platforming, puzzle-solving and some light combat to restore the crystal and save the day. You're helped out by different suits that grant different powers in a friendly nod to the likes of Mario. An interesting element that sets it apart, though, is your ability to collect different resources and materials so that in between levels you can rebuild your village and re-home your fellow citizens. It all makes for an intriguing mix of platforming and simulation with a healthy glow of nostalgia thrown in for good measure.